Can Dog Food Cause Aggression? It’s how they communicate and let us know when they need something, but sometimes dogs start to bark excessively which can be annoying not only for you, but also for your neighbors. It’s important to teach your dog when it’s okay to bark and when it isn’t early on, so their barking doesn’t become a bad habit. As a dog owner, you should be aware of your dog’s tendency towards barking since some breeds are known for being much louder than others. A few breeds that have a reputation for barking a lot are Chihuahuas, German Shepherds, Terriers, Schnauzers and Rottweilers, for example. People often assume that barking is bad, but you can’t expect a dog to never bark. Just like us humans talk (and most of us couldn’t imaging never saying a word), barking is part of a dog’s communication, just like howling, whining, or growling. The trick to keeping your dog’s barking to a minimum is learning to understand them. By paying attention to when and how your dog barks, along with other signals they give you, you should be able to identify if they’re barking because they want food or water, need to go out, or they’re just bored and want to play. Other times it could be a sign that something is wrong with your pet like separation anxiety, a medical condition, alarm or panic. When you’re busy at home or you need to leave the house for a while, you should make sure your dog is as comfortable and relaxed as possible. This way, they’re more likely to be quiet and calm instead of driving the neighbors insane with nonstop barking. Playing calm music or leaving the TV on. One helpful way that you can start to tackle excessive barking once you’ve ruled out that your dog is barking for a good reason is through a little training exercise. When you know your dog is barking for attention, put them on a leash and do some obedience training, getting them to sit, lay down, etc. This method is great because you’re giving your dog what it wants - attention - while distracting them from the unwanted barking, AND you’re getting some quality obedience training in at the same time. Just made sure to keep the training to small intervals so your dog doesn’t get bored. You can also start by training your dog to learn, “Be quiet,” as a command. Start by getting your dog to bark and then show them a treat. When they stop barking to sniff the treat, give it to them while saying the command. Do this exercise daily until you can stop unwanted barking by telling your dog, “Be quiet”. Be sure to praise your dog when they get it right. 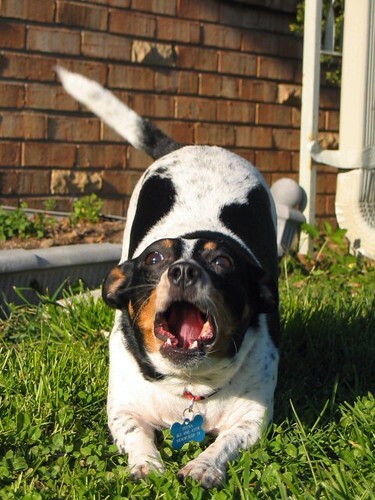 It’s possible that your dog could be barking because of something in the environment. In some cases, like when you are home and there’s a fire or intruder, this can be very useful which is why we shouldn’t train our dogs never to bark. Other cases, like your dog seeing squirrels or birds in a tree outside your window and barking like crazy during the day, are more avoidable with a bit of problem solving. If you notice your dog barking because of outside stimulus, keeping the curtains closed while you’re not home might be a promising idea, for example. If the training exercise doesn’t help with your dog’s excessive barking, another way to get them to stop is with another loud noise that distracts them. This can be achieved by rattling a can with rocks in it or some other contraption (but nothing too scary or that hurts your dog’s ears). After you make a loud noise and your dog stops barking, reward them with a treat. Eventually, the idea is that your dog will bark less when they’re bored or just to get your attention. The important thing is that you don’t always ignore your dog, because they have needs and need attention too. If you’re regularly gone for extended periods of time and your dog is left home alone, it can be hard to stop them from barking when they’re bored, lonely, or if they’re anxious or scared when they’re alone. If other strategies like leaving out toys and making sure the dog gets plenty of exercise before you leave don’t work, hiring a dog sitter or dog walker might be a suitable alternative. Some breeds of dogs are ok with being alone more than others. If your dog has a low tolerance for being left alone, having someone come to take them for a walk and play with them a little can make an enormous difference in their day. Similarly, if you have a puppy they might get bored easily or not be able to hold themselves as long and may bark to go out. If all else fails anti-bark collars like Garmin's BarkLimiter Deluxe Dog Collar or the Sportdog NoBark 10R Rechargeable Collar are two of the safest vibrate dog collars that can help make you and your dog's life easier to when it comes to stopping unwanted and excessive barking. We recommend that you avoid using shock collars on puppies; instead, train your pup by using positive reinforcement. Not every owner is happy to use anti-bark collars on their dog and so safer alternatives include ultrasonic bark-deterrent devices which uses high-frequency ultrasonic sound that dogs find unpleasant stopping and startles them out of their endless barking or the stress reducing collar that releases pheromones aiding stressed dogs in calming them down and reducing unwanted barking. One of the most important ways that you can get your dog to stop barking is by being an attentive, present owner. By paying attention to your dog’s needs, you can make sure that they are being kept happy and healthy. Making sure they have food and water, plenty of exercise, and aren’t bored or lonely should take care of most of your dog’s unwanted barking. If barking has become a problem when you’re gone during the day, it’s important to get to the root of it before your neighbors start to complain. A few solutions to this are hiring a dog walker, playing detective to see if there’s a reason for your dog’s excessive barking, and making sure that your dog is relaxed and comfortable while you’re away. MAIN PHOTO Credit: Found Animal Foundations, via Flickr. Interesting post. I learned a lot. Thank you !